As the lights prepare to go up for Michael Kahn's production of David Ives's The School for Lies, I could already guess exactly what would happen when the play began--and I was exactly right: Cody Nickell, costumed beautifully by designer Murell Horton, appeared on Alexander Dodge's fetching set, and launched into a prologue of rhyming couplets. The evening proceeds from that moment, with couplets and forced rhymes galore, hijinks, and improbable escapades crafted by Ives based (loosely, at times) on Molière's Le Misanthrope. Photo of the cast for The School for Lies by Scott Suchman. 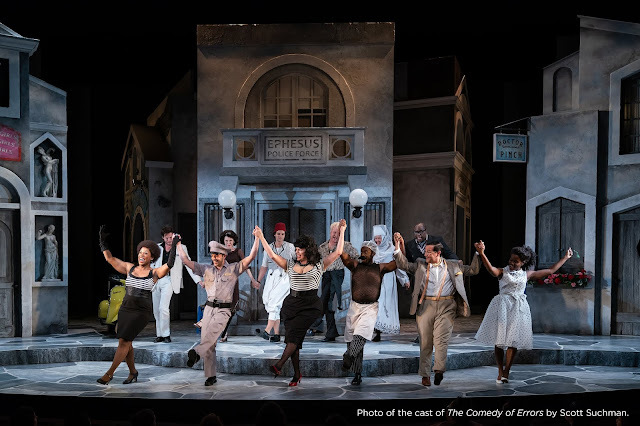 That lack of surprise isn't necessarily a bad thing-- the Shakespeare Theatre Company has previously mounted three other "transladaptations" of classic French plays from Ives that have been very popular with STC's audiences. The School for Lies did not begin as one of these collaborations, but rather was produced independently, with a previous premiere by New York's Classic Stage Company, and Kahn has chosen now to bring it to Washington. Why not continue a collaboration with an artist you enjoy using a formula that has been successful in the past? Ives even revised the piece fresh for this production, based on current proceedings here in the beltway. I've gone on the record that the final entry into Ives' French trilogy, The Metromaniacs, was the best of these efforts, and so I've certainly been curious to see if this play would be its equal. Unfortunately, this work doesn't hang together as neatly as Metromaniacs. Ives's own program notes cite that he chose to work with Le Misanthrope because he didn't like the play, and so freely transformed it into something he preferred. The piece is supposedly centered on a character (here, Gregory Wooddell's Frank) that detests hypocrisy, and yet this aspect all but disappears after the first twenty minutes of the play as he falls for the charms of Victoria Frings' Celimene. Instead, we have a play with a lead character that has a bone to pick with society, but this aspect doesn't seem nearly as important to the production as the entirely retooled love plot into which Frank flings himself. Ives's inserted allusions to "fake news" and other references to hypocrisy in our own leadership feel pasted into the play, a nudge-nudge-wink-wink to DC audiences that have probably heard these same jokes before elsewhere. The play isn't without its bright spots and laughs, and the return of Veanne Cox is a pleasure, as always. I simply felt, however, that I'd seen it all before, and seen it better, done by this same artistic team. There will be plenty who will welcome the chance to see Ives and Kahn do their thing together again, but for the rest of us, I'll set my sights on the 2017-2018 season and look ahead to what's to come.